Last week while paddling around on my Stand-up-Paddle-Board in the Moruya River, I saw a disabled man in a Walker Bay Dinghy. He was very low in the dinghy with his head and shoulders appearing just above the transom. It seemed obvious to me that he had no legs. This image was made even more convincing because also in the dinghy was a woman with a fluffy hairdo, who appeared of normal height and was shouting commands at the poor legless man. At home I spoke with my lovely wife, a nurse, about the physical help required for the disabled man to enjoy the simple pleasures of getting around on the water. It also made me think how lucky we both were to have our health and legs. A few days later while paddling around the river, I noticed a South Coast 36 yacht anchored across from my real sailing vessel "Dare to Dream". As a fellow yachtie I decided to go over and introduce myself. Glenn was sitting in the cockpit, chatting away to me when the wind suddenly changed direction. 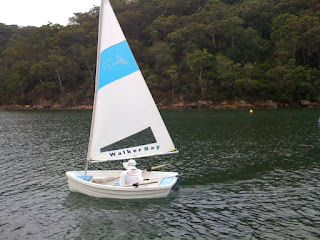 To my surprise a Walker Bay dinghy drifted around the starboard side of his boat. Almost at the same time a fluffy haired Jen appeared on deck. I tried not to look into the depths of the cockpit, to see if Glenn had any legs. Curiosity eventually won the day, and to my surprise and relief he was sporting two well turned legs and ten pink wiggly toes. We invited Jen & Glenn over for drinks on Friday night, and I then proceeded to get Glenn really legless. But that's another story. 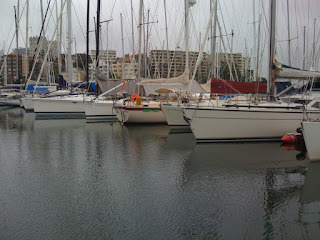 Pics: A 'real sailing vessel' "Dare to Dream" at Wollongong Harbour, and a squat Glenn in the Walker Bay dinghy. We left Moruya this morning Australia Day. No wind so we had to motor down to Bermagui. On the way we had a fantastic stopover at Montague Island, this is a must do! 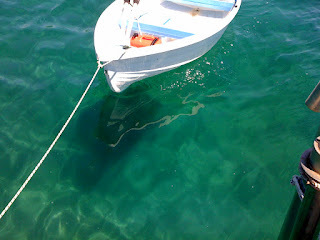 We could not believe the colour of the water, see pic. Camera cannot do the colour justice. Bermagui is a working fishing port with great facilities for visiting yachties with friendly staff and fishermen. Great new buildings with a Cafe, restaurant, wine bar, fish and chip shop and most importantly clean showers, all for $20 per night. We will stay here until the wind returns from the north. Friday or Sat. We will miss Moruya and look forward to a return visit, on our way back. Jen receives 2 marriage proposals!! Sunday afternoon, when I was relaxing on deck with a coffee, 2 fellow yachtsmen paddled over to have a quite chat with me. I immediately offered them coffees, but their attention was drawn elsewhere? You see the reason for their unannounced visits was to ask if they could marry Jen. Well apparently they had been observing Jen washing and polishing the hull of "Crazy Lady" for the last 3 hours, while I relaxed on deck. Ahh, its a tough life. Ask yourself what do you think are the major contributions that the Irish have made to Australian culture? Did you answer: a distain for the monarchy, religion, guiness, Irish jokes, river dance concerts, Van Morrison, Enya, Jim Owen, St Patricks Day, Father Ted, Irish backpackers, gift of the blarney, leprechauns or potatoes? All answers are good, but misguided. Before this weekend Jen & I would have answered any of the above, but now we have had the pleasure to experience a traditional Irish BBQ. You may be wondering whats so special about this BBQ. To start with this BBQ comes in a large flat cardboard box. This was carefully opened by the Irish BBQ Master, to reveal a foil tray 40 x 80 cms, extremely generous sizing for the task at hand, a wire grate and a small white paper bag which rattled. The next essential element was a southerly buster, gusting up to 75klms. We then observed the lighting ceremony, which involved the construction of a pizza box size windproof 3 sided shelter, a faulty cigarette lighter and a small fire resistant wick of paper. After witnessing this important ritual, the ignorant Aussie (Glenn) naively offered to speed up the ignition process by utilizing petrol from a nearby discarded "demon possessed" outboard motor. The offer was declined as a flame miraculously appeared. We watched in reverent wonderment, as the white paper bag burst into flames to reveal several small black crunchy stones. One stone began to smoke. Great cheers of merriment erupted from the assembly. It was explained that cooking could not begin until all stones had turned to grey. As the chosen stone turned the required colour, our stomachs began to rumble in anticipation. Several hours later the cooking process began, when some other black stones obligingly turned the required colour. More cheering from the hungry crowd. The food was then carefully arranged on the grate; a delicate selection of international sausages. We were then privileged to observe a natural phenomenon. While one sausage turned a gentle golden brown, the 15 others migrated around it to share the warmth. The presiding Irish master of BBQ's selected twigs of a certain size and shape, to turn the resistant cold sausages. At this stage 3 live specimens jumped off the BBQ preferring to lie in the dust, rather than wait any longer. They were quickly herded back on to the not so raging inferno to suffer a slow and painfully boring death. To our amazement, before we knew it all the snags were perfectly cooked. It didn't take more than a few seconds for them to be devoured, with tasty turkish bread, mustard and condiments. After all food was consumed, the tray and all its contents spontaneously combusted, presenting another challenge for BBQ master. When we last saw him he was waist deep in the cleansing waters of the Moruya river, tray in hand and geyser like steam rising from his shorts. So ends our fable of how the Irish BBQ became popular in Australian culture. Thanks Dave & Gertie, we had the best time and the food was delicious. Pic: Glenn & spot the Irish BBQ. OK. So I admit have been a bit casual in taking my turn at skippering the dinghy. I decided that the time had come to regain the skills I used with the previous run about, an inflatable. 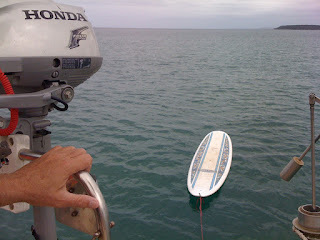 (and easy to balance toy) This new (to us) hard plastic dinghy is our work horse and we use it often. Glenn just sort of fits very nicely in the drivers seat next to the outboard. The calm aqua waters of Moruya Bay seemed to be the perfect learning area. What I hadn't counted upon was the importance of passengers being strategically placed equally in both weight and seating configuration, AND the fact that Glenn just loves action and just can't sit still. The steering seemed strangely erratic as I carefully concerntrated on the job at hand, watching for all of the small splashy waves and ripples. It just didn't make sense to me that the course could change dramatically for no apparent reason. The trip was from the town wharf back to the entrance of the river and I was growing increasingly dispondent at my futile attempts to master such a simple task. his arms towards our destination. Yes the temptation was very real at that moment to make a sharp turn to port side but I used my self control and firmly asked him to stay still. Begrudgingly he did. This kind of thing happens every day. When the tides and the weather align favourably we'll be off to Bermagui. We love Moruya! Will we ever leave? Moruya River is a hidden gem. Crystal clear emerald water , great surf spots, fantastic protected anchorage with great views and right on the beach,(check our where we are) friendly and helpful locals, lovely country town a 1/2 hour dinghy ride away. We are having a great relaxing time here, can you guess that? The funny thing is we only lived about a 50 minute drive from this cruising sailors paradise, and it is only a 3 - 4 hour sail from Batemans Bay where our boat was moored. We wished we had discovered it earlier. Like I said we are having fun down here, made some new friends. Martin & Karen from "Dare to Dream" a 38ft fibreglass cat. They know people that know us through the coxwains course, oh you mean the "Crazy Lady" from "Crazy Lady" was heard. Jen and I have been having cooking competitions, with Glenn's hot bread, Jen's muffin madness, pork roasts, green garden salads, BBQ chops, mustard and lime chicken, and lots of drinking of Barefoot Radler and freshly perculated coffee. Ah what a life! but someones gotta do it! We were leaving Monday, but tide suits better for a Tuesday sail south to Bermagui. 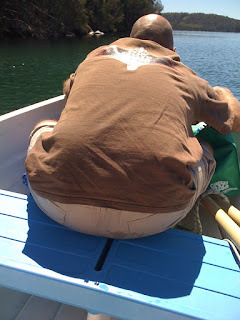 ps: stay tuned for very funny but true stories of the Legless Lovey and the Demon Possessed outboard and the Irish BBQ. Pics: View from anchorage and how's the colour of the water? If you look at all the pins it also tells you where we have been. Click on the pins for what happened. I finally had a surf yesterday, (Friday) now don't get me wrong I have been surfing in the last month. This surf was special as I had to paddle from the boat, at Barlings Beach about 1/2 mile from shore. It was a great small malibu wave. Unfortunately the swell continued to rise over night and we spent the worst night ever on Crazy Lady. My good mate Winni (James) Patterson drove down to Moruya this morning, (Sunday)for a surf. 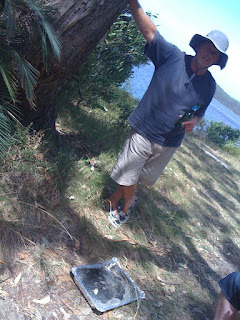 We ended up surfing the Moruya river mouth, right next to the bar you have to cross to get into the river. This ended up being almost a 4 hour surf, when paddling back in we found another great break on the inside to amuse us for another couple of hours. Then back to Crazy Lady where Jen cooked us Bacon & Eggs, ah life is tough. Looks like a week of good surf in Moruya, can't seeing us leave here for awhile. Maybe Friday or Saturday depending on weather and tides. 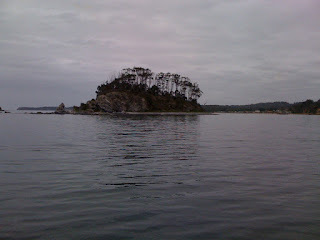 After spending 4 days in Batemans Bay, we motored down to Barlings Beach (about 8nm)in crystal clear glassy conditions. We really enjoyed our time in the marina, where both Jen and I worked on various projects, repairs and upgrades that became apparrent on our shakedown cruise to Pittwater. Thanks must go to Jeff and Jason at BB Marina who went out of their way to accomadate us, especially considering they were really busy allocating spaces for the extra boats in the Bay, for the Tollgate Fishing tournament. Thanks again Jeff, hope to catch up with you in Hobart. I must also give thanks to Paul McDonald from Batemans Bay Marine, who delivered a sucker pump down to Crazy Lady as we were leaving the dock. A sucker pump. (for Glenn) Paul gave me some great advice for servicing my outboard motor, "Glenn don't #%&@# touch it again!" You see I had the difficulties after I serviced it! It stopped working, oh Betty!!! Denise and Dennis our long suffering next door neighbours, thanks for mowing the lawn, and the emergency coffee and fruit slice, yes I did finish it the next day. Thanks again! Denise we want to catch up with you in Hobart as well, please keep in touch. This girl is a legend, makes me proud to be a old Aussie. I hope all the critics and naysayers are now eating humble pie. Well she may have rounded Cape Horn but I just crossed the Moruya River Bar. Pic: Ella Pink Lady Surfing in 40knots Cape Horn. 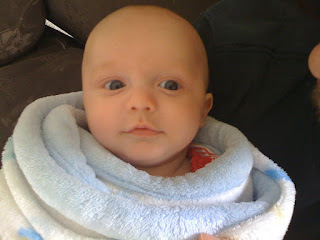 Here is Matthew, my grandson. Very cute. I've been feeling that since we set sail a month ago I would have liked just a few more days to prepare Crazy, to make her more of a "home". I know that most people never really feel that their boats are ready for a trip, and it does require some wisdom to know the point at which the boat is sea worthy, comfortable and capable of cruising. Boats always need improvements and updates with ongoing maintainance as much a part of life and routine as washing dishes etc. We are back in Batemans Bay marina now, on a small break before trying to sail south once again. I'm thrilled because we have ELECTRICITY and that means that I can finally attend to the sewing projects that have been on my mind. Some of you (my sisters) will not be at all surprised to know that I have several rolls of fabric onboard as well as a walking-foot sewing machine. This machine lives in a special area under the navigation table. I created the perfect sized locker with the help of a jigsaw, and am very proud of the results. I wish I was a carpenter so that I could do clever wood projects: such as a timber floor, or extra shelving inserts, but I'm hoping that with a few screws and canvas I can create specific storage spaces for all of the homeless odd shaped items. Everything has to have a specific spot to live, otherwise the boat swallows up all of the small stuff into the bases of the lazarettes, only to resurface when the boat is for sale. I have a few cane baskets that act as attractive hold-alls in the galley, but I'm fully expecting that as the sea salt continues to saturate the air they will grow mould. Actually mould is a continual issue for sailors. Opening up the boat is the first thing we do once we've stopped. Crazy was very neglected when we purchased her, and was a mould filled stinking bucket. Sugar soap for the ceilings and huge quantities of vinegar with lemon oil and elbow grease for all timber areas made for a good few months of asthma. 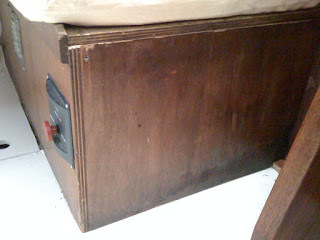 I still spray vinegar and orange oil regularly which also gives the interior a nice warm glow. I turn over the mattresses daily, and have invented a mesh layer of shade cloth ruffled in opposing directions to aerate under the foam. The exterior deck and hull also need constant attention. Salt water attracts moisture and Crazy loves throwing up spray. Then everything feels sort of slimy. Really dedicated sailors: those who are "house proud", splash around in the rain scrubbing things during downpours. I'll let you know if that obsession overtakes Glenn. I'm just finishing this blog some days after I started: the computer previously ate two lengthy attempts. Started writing this in Batemans Bay, but we are now in Moruya. The South Coast is Unique! We recently spent a week in the Pittwater region of Sydney. Now don't get me wrong its a great cruising area, and there are so many hidey holes, anchorages and places to visit, its a lovely place. I think that Alan Lucas rates it as the best cruising grounds on the NSW coast. I may beg to differ with Alan on that point, called me biased, call me a local. On returning to the south coast, Jervis Bay to start with, I couldn't help think that its a far superior cruising location than Pittwater. The positives far outweigh the negatives. Negatives 1st, there are limited facilities for yachts. In other words, bring everything with you, including fuel. The anchorages (with limited public moorings) are on either side of the bay, and you need to watch weather conditions carefully. With mobile phones and mobile Internet connections this now relatively easy. Now the positives, ever wonder what its like to anchor in an aquarium? Well you can in Jervis Bay, the water is so clear you can see the bottom and all the fish at The Hole in Wall anchorage, Dolphins are in seen regularly, on most sails. Sailing is something you can do in the Bay without wind shadows(Pittwaters biggest problem) great runs with good clear breeze are the norm. Shopping and provisioning can be done, in Huskison and Vincentia by anchoring off these delightful villages and taking the dinghy. Oh and above all, less crowded, 6 yachts moored at Hole in Wall last week. To our yachting friends in Sydney, Bruuuce & Sue/Lynn & Andrew/Robb & Katrina check Google Earth, look at your charts and take the time to come down and enjoy what Jervis has to offer. Believe me its well worth it. 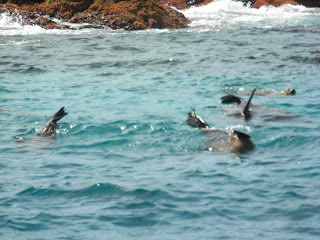 We decided to stop at North Durras, on your nautical charts known as Point Upright. The possibility of a surf was on our minds. We knew this was well protected from a North East wind. 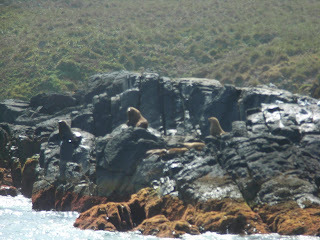 No surf, (as usual) but what a great anchorage, its obviously been missed on all cruising guides. 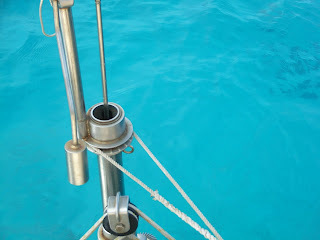 The water was very calm and swell free, as we anchored in 4 mts of sand bottom crystal clear water. 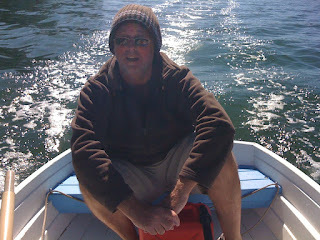 (see pic above)After a relaxed lunch and swim, we braved the gusty conditions for an hour long sail to Batemans Bay. Pic: View from the anchorage Upright Point. With level one water restrictions in place, Shoalhaven Council decided drastic measures needed to be taken. Former Jervis Bay resident John Jenkins was summoned back on special consignment. His mission which he chose to accept, was to sail to the centre of Jervis Bay, to arouse the rain gods, to once again bring forth heavy precipitation. You may be asking yourself, why? what is so special about JJ, what can he do to summon rain? Although not ready to reveal his special abilities, I can tell you this, he now resides in the Belligen Valley on the northern NSW coast and in 2009, he was able to conjure up 5 major floods alone. In rainmaker circles his name is mentioned in hush tones as the "flood magnet"
What has Crazy Lady and her crew have to do with this meteorological phenomenon? We were chartered to take JJ and his members of the rain making tribe to the centre of Jervis. Now JJ and Glenn go back many years, and it was JJ who introduced Glenn to the gentle art of keel boat sailing. Glenn who is not the sharpest tool in the shed, should have realized that something was amiss, when in lesson one JJ suggested that running aground is the 1st skill required. He then demonstrated how to run aground, this story will be told at a later date. Included in the the rain making team , were Fiona JJ's long suffering wife, who supplied much needed refreshmentsts, Jen's daughter Brenna was also asked to provide her helming skills, for the difficult task of finding the dead centre of Jervis Bay. Jen's contribution, was master of ceremonies, after her success at recent renaming ceremony. Brenna's friend Craig offered support by wearing his ancient ceremonial beads. We had a great day, but we have still not received any significant rain in the region. JJ says it's only early days yet. So residents of Shoalhaven, please prepare for a major flood event. Pics: Brenna at Helm, and rain making team. Crazy Lady is now heading south for Tassie. Just too busy looking and singing! Last night at about 10pm, when we were getting ready to sleep Glenn went up on deck to attend to a final anchor check. (totally naked as old surfers like to be.) By the torchlight he could see not only the sea floor below us but also a miriad of inquisitive fish. We both spent the next hour exploring the water around us by torchlight. I whistled and sang a variety of folk songs and christmas carols to our real life aquarium friends. I wanted to know if they would respond in anyway. Unfortunately they were tone deaf. That may sound strange to you, but I recently sang "Little baby Jesus" and "Away in a manger" to a pod of dolphins south of Ulladulla. (My theory is that the melody transends the differences in the species, and that all creatures may enjoy the sounds of soothing music, as babies do). Anyway after a while the main pod of dolphins finally left us. Only one dolphin stayed swimming with us as the yacht sped forward. For the next 45 secs. this solo dolphin swam up side down, tummy up to me just under the water's surface. Anatomically it was all very interesting. I kept singing. And then it was gone. I think that specific dolphin was communicating with me. Not really sure what it all meant. Glenn and I have been thinking about how little time we have to watch TV or DVDs now. We just keep noticing so many other things in our surroundings that fill up our time. We also often feel totally exhausted. The previous entry: Glenn's storm story, was seen by me in a totally different light. I remember watching the anvil shaped clouds forming for several hours, then the development of a long long white sausage cloud, and above this for as far as I could see, a narrow horizontal green haze band. All very visual. I do not recall any noises at all. The movement of the seas, the plunging of Crazy down into enormous gullies and sea spray pelting (and cleaning) the decks are very clear memories for me. Just random thoughts of mine but I thought they might give you some insight into why we are out and about on the water. Not all Beer and Skittles this cruising life. When we started this blog, we promised the good with the bad. Yesterday was bad!!! Not all bad, but enough to make it bloody bad. 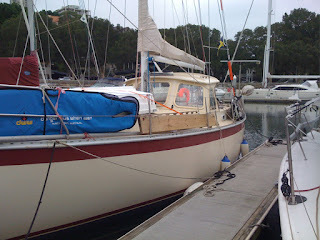 The plan was sail from Rushcutters Bay Sydney to Jervis Bay, about 90 nautical miles. When I awoke at 3am and felt too tired to get up, that should have been a warning. I slept another hour then decided it was time to leave. After breakfast and refueling we left at about 5.35am. The forecast was for 15 to 20 knots from the NE perfect for the trip south. 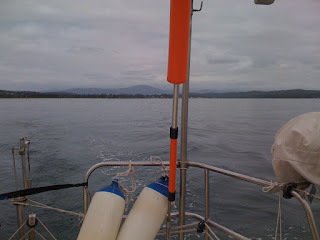 We had a relatively uneventful sail down past Botany Bay, Cronulla and Wollongong, with Winni the wind vane steering. We were actually relaxing and taking turns in having little cat naps. 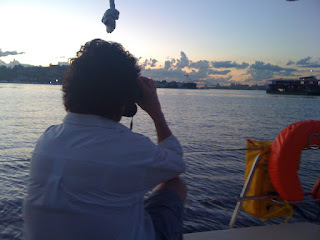 We were sailing about 15 nautical miles offshore, trying to pick up some east coast current. (you know the one that Nemo rode down) We both noticed storm clouds brewing around Kiama and Saddleback mountain. These soon developed into a full on thunder and lightning storm, which was quite spectacular from our position out at sea. Little were we to know that the effect this storm would soon have on us. Jen was happily watching the display and strange cloud formations and colourings, when she pointed out an extremely long light grey rolling cloud running parallel to the visible shoreline. Meanwhile the wind was building and we were flying along at about 6.5 to 7 knots, great fun. I noticed it about a minute before it hit. I looked to my right and saw the water frothing and foaming, and what I would call a squall line with spray flying everywhere. I yelled to Jen who was relaxing below, to come and give me a hand to furl the head sail. When bang, it hit with a vengence, and I mean vengence. We suddenly entered a world of chaos. The noise is hard to explain, rigging screaming, head sail flogging out of control, lightning flashing and cracking and the water around us was white with foam and spray. Luckily I was wearing my brown underwear. My first instinct was to go below and hide under the bunks with my head under the pillows. Dear readers do not abandon faith in me yet. Although I'm a self confessed coward at heart, I could not let down Jen or Crazy. With bullets of blinding rain and wind playing havoc with my hair do, I sprang into action. 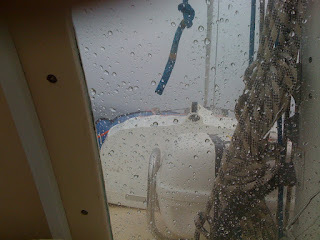 I tried to pull the furling line in, but the storm was too strong for ordinary measures. 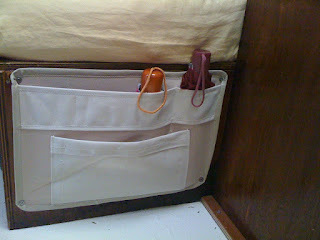 I attached the furling line to the main sheet winch and was then able to furl the sail. This brought the boat under control. The storm subsided almost as quickly as it came, but during the height of the onslaught our wind instrument recorded gusts of between 50 - 60 knots. 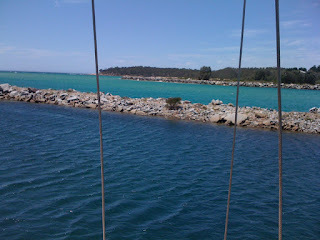 We then continued our journey to Jervis Bay with about 1/3 of head sail out in 25 - 30 knot winds. Now you may think the story ends here, I wish it did, but there is more. We finally arrived at Jervis Bay just on sunset. (it was beautiful as well)The wind then started to gust again from the NE between 30 - 35 knots as another storm cell passed to our north. With reduced sail Crazy Lady revelled in the conditions with speeds of 8 knots over ground and spray flying in all directions ie: a face full of yours truly. Now this was fun. Unfortunately darkness descended all too quickly, and boy it was black dark. We now had to find an anchorage, easy you might say, but not in unfamiliar waters. With no visibility, we were reduced to using the chart plotter and the depth sounder + dolphin torches. I can't do justice putting our feelings at this point into words, suffice to say that we finally found a mooring at approximately 10.45pm. It was a long bloody day!!!! Lessons learnt: Always be in an anchorage well before sunset. Don't rely solely on marine weather forecasts, check general weather for thunder storm warnings etc: Don't do such long distance day sails, without a contingency plan. Footnote: Despite my attempt at humour all the above is true. Pic: Crazy Lady blasting to Point Perpendicular. Time flies when your having fun, here we are into the 3rd day of the new year! Whats happened since Pittwater? well New Years Eve was a hoot! We were anchored up in Smiths Creek, up near Cottage Point. Bruce and Sue once again played host to a tasty dinner. Also joining us were, Lynn and Andrew from Mischief and Andrews wonderful sister & brother Patrina(hope Ive spelt that right? )from London, and Nigel (aka Simon) from Brisbane. After dinner we rowed to Rob & Katrina's new boat with a crowd of other folk from the CCC, this resulted in more guitar playing and singing, sorry I was soooo drunk and nearly dieing from dehydration and heat exhaustion, Rob I really would have liked to continue playing but. Hope to catch up with you all in a couple of months, when we sail north from Tassie. Fast forward to the 2nd, we left bright and early for the planned sail to Cronulla. Flukey winds and not wanting to to start the motor, left us floundering off Sydney Heads when the sky went black, and I mean black!!! We were hit with a massive downpour that was soooo heavy you could only see about 50 mtrs in front of you. If it wasn't for the compass and the chart plotter, I would not have known where I was. We are now berthed at the Cruising Yacht Club of Australia (from here on in known as CYCA)for 2 days. I decided I needed a shower or my clothes were leaving me in protest over the smell, getting laundry done, going shopping and taking my faulty laptop power supply back to Jaycar. I got lost on arrival and went down the wrong finger at the marina, and I had to bid a hasty retreat. Now reversing a full keeled yacht is no easy feat, because there is very little control. Adding to the pressure of performance anxiety, were the bevvy of well heeled spectators. (crew of Ichi Ban nursing a broken mast and Play Station 3)As usual they all seemed to appear on deck just as I realized I had to turn around. Now tell me you don't believe in miracles, but Crazy Lady sensing my fear and the impending doom, spun around in a boat length, leaving both me and the CYCA members, including all the marina's armchair admirals gob smacked. I waved to them all as I casually motored to the correct pen, with a renewed confidence. Now Crazy Lady sits proud amongst all the multi million dollar yachts. Pics: Couple of Crazy Lady at CYCA and downpour. We are now in Sydney Harbour, sitting out the southerly change that went through last night. Anchored in Rose Bay, with a million dollar view of the bridge and harbour. This started me thinking what things would be like without Jen on board. Well I can tell you now this whole adventure would not be possible without her, she is the one that organizes all the practical bits and pieces, her enthusiasm knows no bounds. This trip was something that I have wanted to do for over 30 years, but without the help and support that I have gotten from Jen, I would still be sitting at home dreaming about it, or sitting in the boat with smelly dirty clothes, eating jatz, cheese and chips. Behind every hopeless bloke there is a very capable women. Thanks Jen! ps. She doesnt know I'm posting this!!!! Pic: Jen a rose in Rose Bay! !